I had the honor yesterday of visiting a neighboring school in my district and helping their third and fourth grade teams interpret some data and develop a plan of action. I was flattered when they asked to visit and observe my team and it was fun to take a "field trip" to their school and help them put their own data to use! I know that many schools use the MAP assessment to measure growth and so I thought that I might share the BASICS of what goes into our interpretation of the results in case it would be useful to you! This is the organizer that we use- feel free to grab a copy! My team has decided to take things a bit further this year. We are a small school and have three third grade teachers with 60 students total. So, we share our kiddos A LOT! For us, it is easy to keep up to date with the communication and the kids love that they get to have all of us as their teachers. 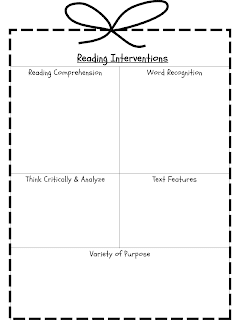 We have a 90 minute core reading block which we group based on those overall RIT scores I mentioned earlier (and our teacher judgment of course). Then we have a 75 minute math block that we group the same way. AND THEN, we have a 30 minute intervention time that we group based on those strands I talked about earlier. I am teaching an algebra strand right now for math intervention. How do you all meet the learning needs of all your kiddos? Do you "share" kids with other teachers? Or do you have small groups in your classroom? Or both/all of the above :) ? Thanks so much for sharing your ideas. This is the first year my school hasn't used NWEA testing for our kiddos due to budget constraints. I loved the data that this test provides within a short period of time. ( Our school did just finish up a pilot through NWEA of the common core standards test.) I am a new follower. I too teach 3rd grade. For some teachers, it is hard to share because they feel so responsible for their "own" kids' learning. We use a variety of assessments: DRA and IRI building wide, phonological assessments pre-k-1, and Acuity for grades 3-5. Hey Julie - My school just started using the NWEA Map tests too. I teach first grade this year, and I really like the feedback the test provides! Plus, it's so nice not to have to administer all of the paper-book tests. This year I've broken the kids into small reading groups and we focus on skills and reading based on my own observations of their needs and the Map test feedback... I also try to plan whole-class instruction based on where the greatest chunk of my kids fall, and even some whole-class instruction targeted to my highest-scoring students. I taught at a private school and their philosophy was teach to the top, and the other kids will rise up to it. ? But I'm still very much open to ideas, so I loved this post. I submitted before I was truly done! :) My school also switches classes for math, and I think it works great! Plus, I wanted to ask how on earth you have just 60 kids and 3 teachers? That sounds SO nice! It is nice- except my school is so transient that we start the year with 75+ and then ebb and flow as the year goes on- I probably lose/gain at least one student every month!